The 'Leave' vote in United Kingdom's referendum on membership of the European Union ('Brexit') has been greeted with concern by much of the watching world, particularly in Europe. Although nothing has yet happened which warrants a new map in Omniatlas's Historical Atlas of Europe, it is worth examining how the Brexit vote might further destabilize the situation in the EU and its component states, both politically and economically, by examining the present situation in the Union. I hope this victory brings down this failed project and leads us to a Europe of sovereign nation states... Let June 23 go down in our history as our independence day. The United Kingdom is not currently the country least favorable to the EU. Although 52% supported Brexit, 48% opposed it. 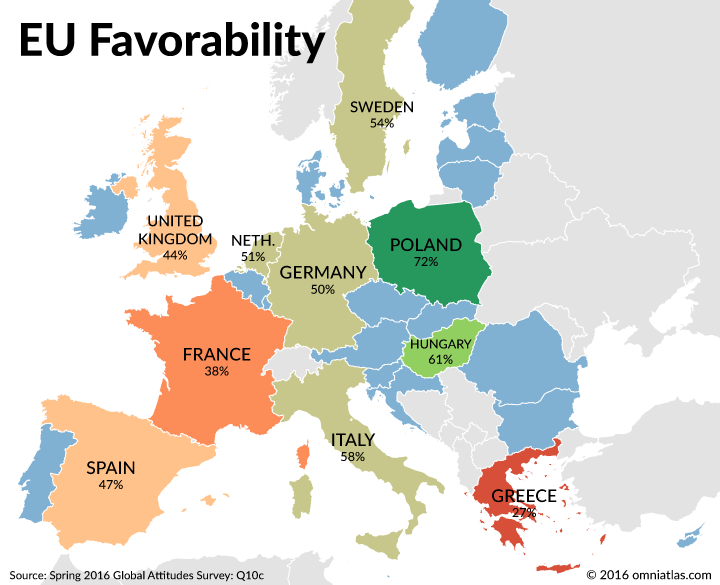 A 2016 Global Attitudes Survey on favorability to the EU (above) implies that if a referendum were conducted in France and Greece, there would be even greater support for leaving the Union. Although no such referendums are planned at this date, this does not bode well for the continuation of the European Union. Brexit passed due to its support in England and Wales. In Scotland and Northern Ireland, voters opposed leaving the EU. Indeed Scotland, whose bid for its own independence had been narrowly defeated in a 2014 referendum partly due to pro-EU sympathy, immediately threatened to hold a new independence referendum. Whether or not the UK does ultimately leave the EU and whether or not this impacts the British economy, it seems that Scottish separatism can only increase as a result of the 'Leave' vote. Scotland is not the only stateless nation in the EU with pro-EU sentiment. 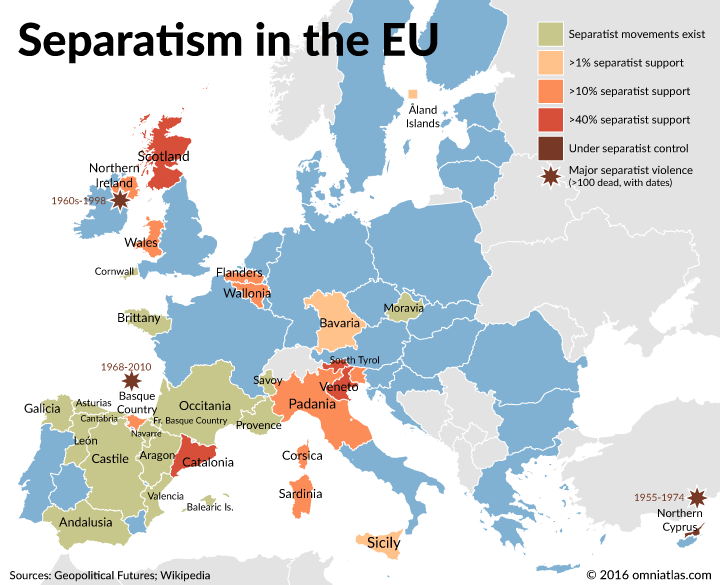 The formation of the European Union helped bring about the end of the violent separatist conflicts in Northern Ireland and the Basque Country in Spain. Demands for independence have also sprung up in other parts of Europe, particularly after the beginning of the European economic crisis in 2010. Should Scotland secede from the UK or should other nations leave the EU, these demands are likely to grow, possibly leading to an expansion of terrorism in Europe. The European economic crisis hit hardest in Greece, which had huge sovereign debts. The Greek crisis was partially but not completely resolved with European support in 2015. However it is possible the crisis may reignite, particularly with the uncertainty generated by Brexit. 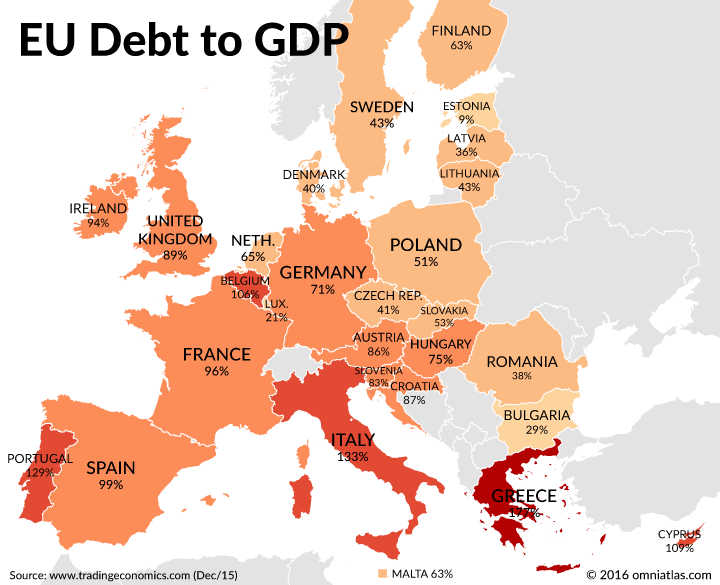 Most concerning is Italy, whose relative debt is second only to Greece but has 9 times the GDP. Another way to view the economic crisis is through credit ratings. Again Greece and Italy, along with other countries of Southern and Eastern Europe, are shown in a significantly worse light than the countries of North-Western Europe, who credit-rating agencies believe more capable of managing their debts. However the UK already has the lowest credit rating in the latter region, barring only Ireland, and it is possible that Brexit could see it dropping further. 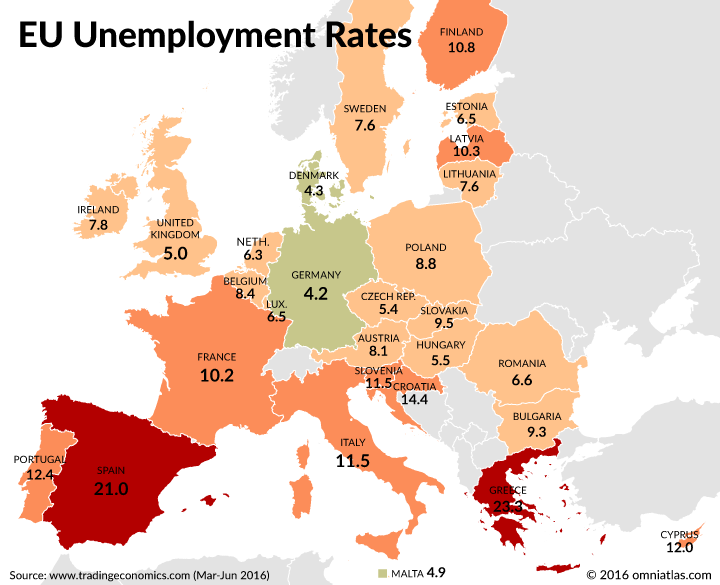 Less abstractly, the crisis can also be measured in unemployment statistics. This provides a slightly different view of the woes facing the EU, with the most extreme cases being Greece and Spain. Here the UK performs better than many of its continental rivals, even AAA rated countries such as Sweden and the Netherlands. Again, though, it seems that Brexit will not improve this situation. In short, the European Union was in crisis before the Brexit vote and would have remained in crisis regardless of that vote's outcome. However, it seems unlikely that Brexit will increase either the unity or the economic prospects of either the UK or the EU. Very good and demonstrative analytics.